This post is sponsored by Rodelle. All opinions are my own. This was originally posted in 2015 and has since been updated in 2017. 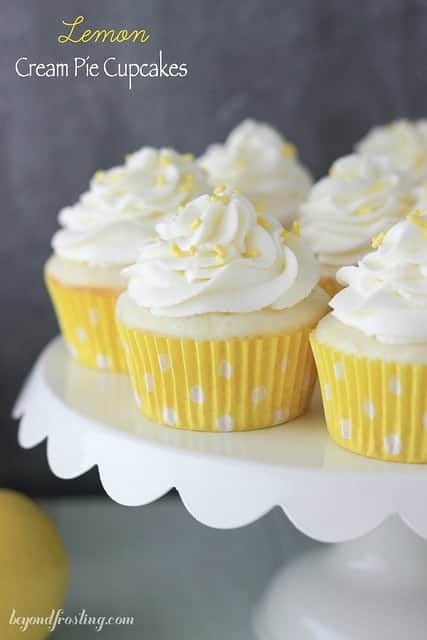 There is nothing like sinking your teeth into the first bite of a cupcake and wiping that leftover frosting off your face. Sometimes you might think to yourself, “this cupcake is too pretty to eat”. I don’t have that problem. My first instinct is, I need to know what this tastes like, so I usually just dive right in. Ya feel me? 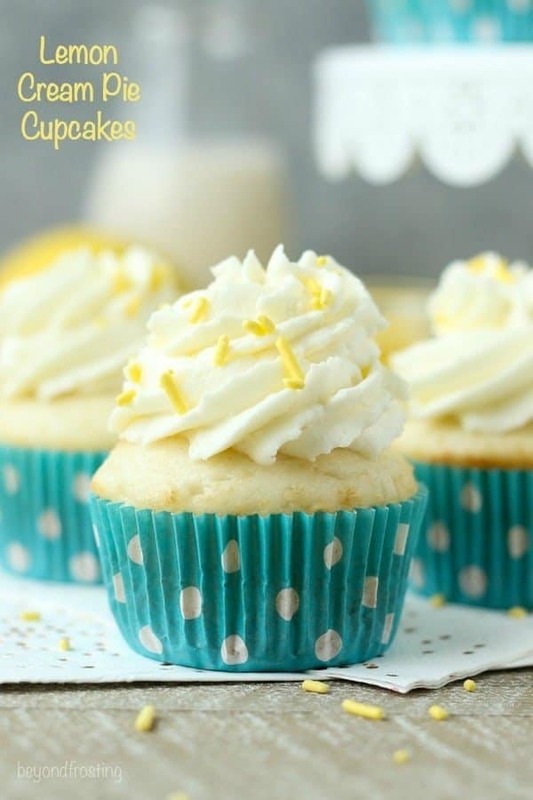 It doesn’t matter what time of year it is, these Lemon Cream Pie Cupcakes are the perfect excuse to bake. I’ve been holding onto this one for awhile and it’s finally time to share it! This is a light and fluffy vanilla cupcake with a lemon mousse filling and a cream cheese whipped cream. Can you say amazing? You remember my friend, cream cheese whipped cream? I used it earlier this week on my Strawberry Cheesecake Poke Cake and also the Coconut Cream Pie Cupcakes. If cream cheese isn’t your thing, these would be perfect with a plain whipped cream too! 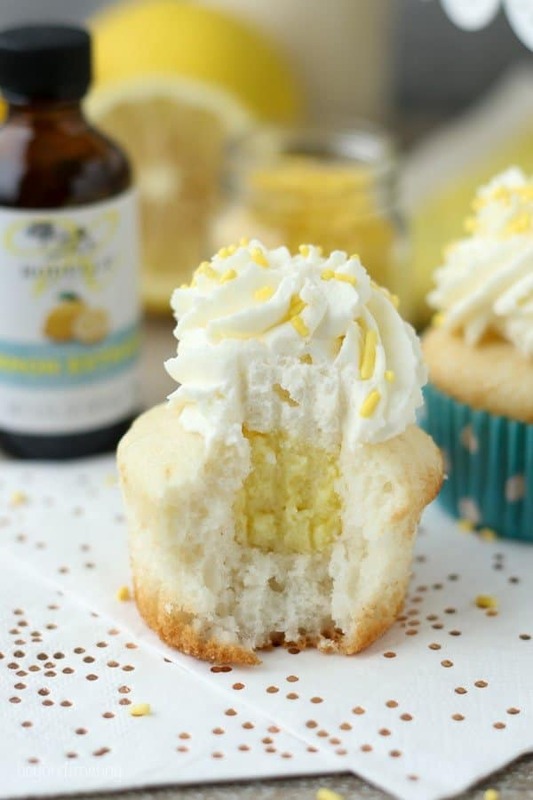 The cream cheese whipped cream lends itself nicely to this cupcake because it is a little more tangy than a traditional whipped cream. It’s also much thicker which makes it nice for piping. I decided that these cupcakes should be a vanilla based cupcake instead of a lemon cupcake. I didn’t want an overwhelming lemon flavor so I grabbed my Rodelle Pure Lemon Extract for the cupcake batter. 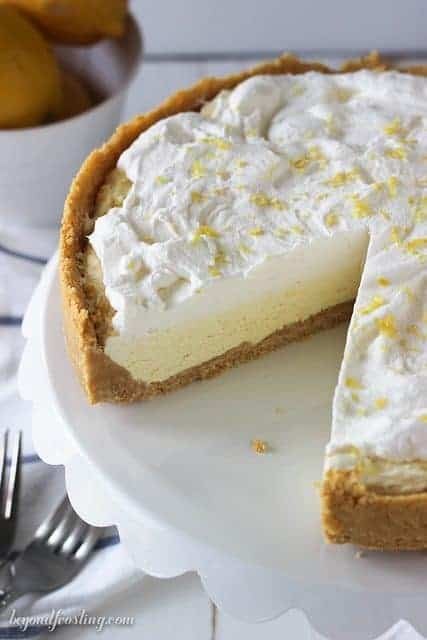 This just gives it a subtle lemon flavor to compliment the filling without over powering it. I fell in love with Rodelle products after I attended a baking retreat and had the opportunity to try their vanilla beans and extracts as well as baking cocoa. In my years of baking, I’ve come to realize that quality ingredients are essential for my kitchen. As I became more familiar with Rodelle beyond their vanilla products, I found myself reaching for the almond extract and now my bottle of lemon extract is almost gone to! So back to these cupcakes. For simplicity, I used a classic vanilla cake mix, but the substitution of the buttermilk instead of water and the addition of the sour cream. This cupcake turns out to be quite moist and a lighter texture. 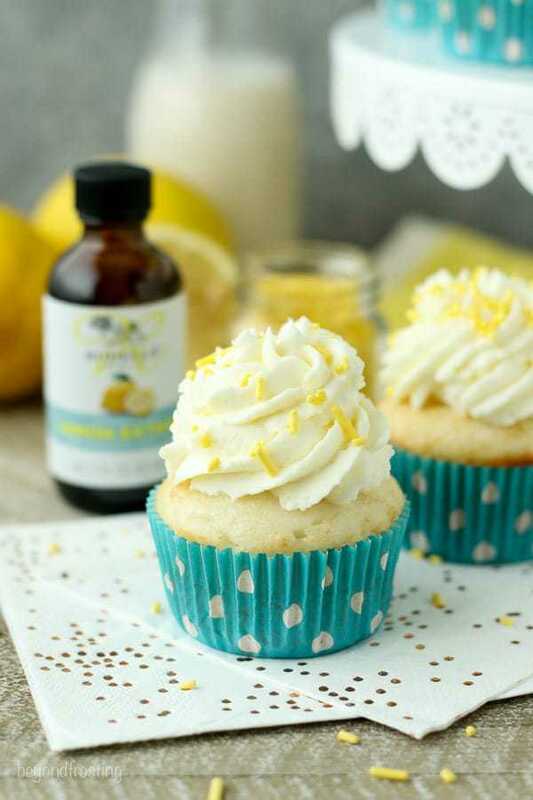 Of course, you can use your favorite vanilla cupcake recipe but substitute the vanilla extract for lemon. Now there are a couple steps involved between making the cupcake, the filling and frosting. One way you can cut out a step is to use a frozen whipped topping instead of fresh whipped cream in the mousse. I prefer the taste and texture of the fresh whipped cream, but I understand not every one wants to make it. So I like to provide the option. Cupcakes are my favorite thing to make because the flavors can be so different every time. You can be as creative or as lazy as you want, and sometimes lazy cupcakes are the most delicious! 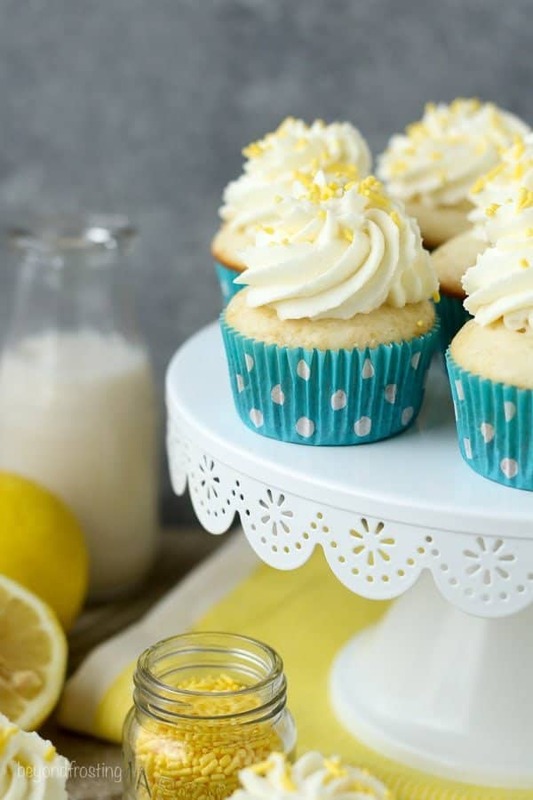 Excuse me while I go make another batch of these Lemon Cream Pie Cupcakes. 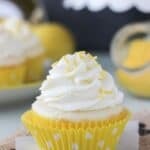 Impress you friends with these luscious Lemon Cream Pie Cupcakes. 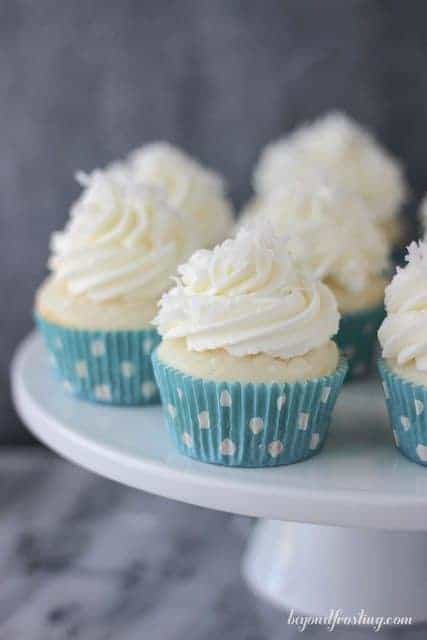 A fresh vanilla cupcake with a delicate lemon mousse and topped with cream cheese whipped cream. In a large mixing bowl, combine cake mix, egg whites, buttermilk, vegetable oil, sour cream and lemon extract. Beat on medium speed until all ingredients are well mixed. Scrape down the sides of the bowl and stir from the bottom. Divide batter evenly between lined cupcake pan. Bake at 350° for 15-18 minutes. Check for doneness by inserting a toothpick into the center of the cupcake. If the toothpick comes out clean, your cupcake is done. Cool completely. For the filling: In a small mixing bowl, combine instant lemon pudding with the milk. Whisk until the pudding is dissolved. Refrigerate the pudding until firm, about 10 minutes. Prepare the whipped cream. Put the bowl and whisk attachment in the freezer for 5-10 minutes to get them really cold (this step is optional, but a common practice I use.). Pour the heavy whipping cream in the chilled bowl and beat on medium speed for about 3 minutes. Add the powdered sugar and increase the speed to medium high. Beat until stiff peak form. Add the lemon zest. Remove the pudding from refrigerator (after it has set) and gently fold in whipping cream. Place the filling in a Ziploc bag and refrigerate until you’re ready to use. For the frosting: beat the cream cheese on medium-high speed for 2-3 minutes until cream cheese is smooth and free of lumps. Scrape down the sides of the bowl occasionally. Next add the remaining heavy whipping cream and beat on medium-high speed. Slowly add the powdered sugar and beat until still peaks form. Refrigerate until ready to use. To assemble the cupcakes, remove the middle of the cupcake using a spoon, knife or cupcake corer. Cut off the tip of the Ziplock bag and fill the center with the lemon mouse filling. Top with cream cheese whipped cream using a large open star tip. Sprinkle with lemon zest if desired. Gorgeous cupcakes! I think a batch for the 4th must happen at my house!!! These look amazing! I love the lemon in there! 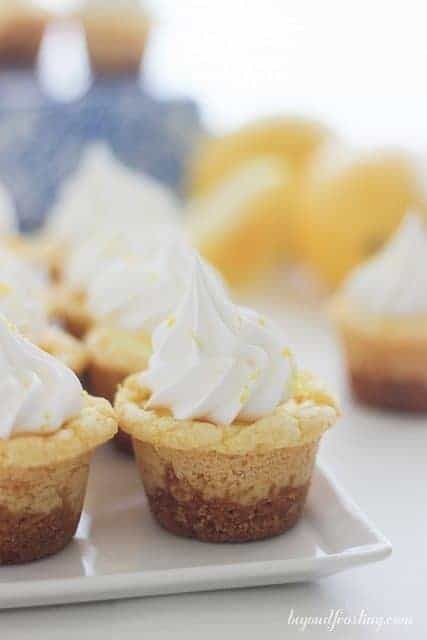 I love lemon desserts and these look so good!! Hiya… will this frosting melt quick if it is outside the fridge? Hi Danielle, I do not suggest to leave it out in the heat. It should be okay for about an hour, but other than that I would suggest to use a vanilla buttercream instead. Hi Elena, you sure can! Just keep them in the fridge, you can even frost them and refrigerate ahead of time. In fact, I would recommend frosting them to help prevent the middle from getting dry. Enjoy and happy baking! Seriously PERFECT for summer! So light and bright and cheerful and you know I love lemon anything 🙂 Gorgeous!